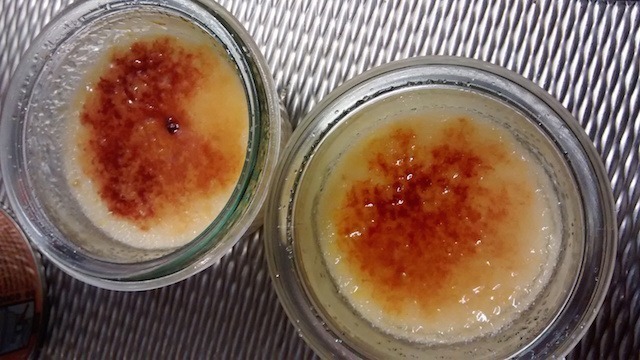 Summary: Crème brûlée can be difficult to make and there is a large risk of overcooking. 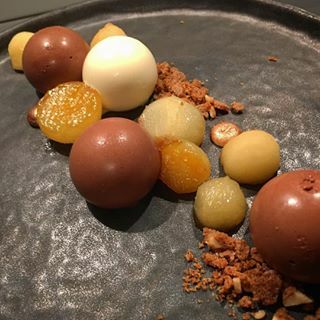 By using a water bath, this classical dessert becomes very easy to make. 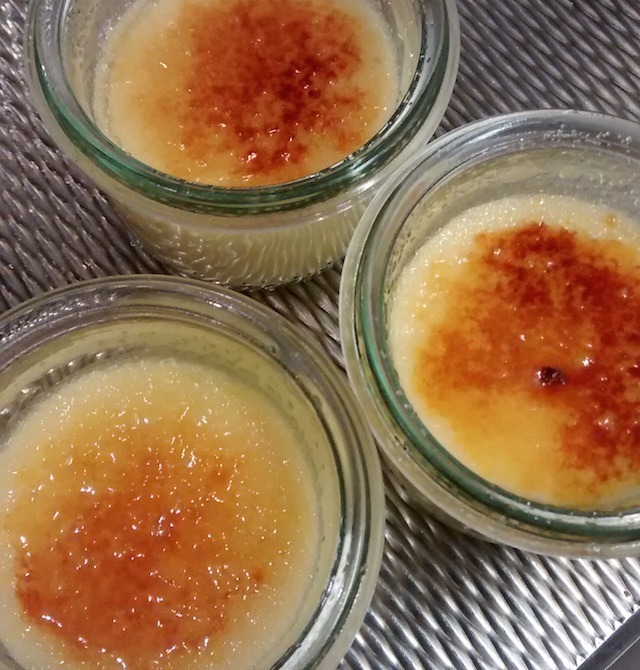 Making crème brûlée can be a joy, not only because of the end result, but also because of the whole process: from making the custard to creating a nice caramel crust. 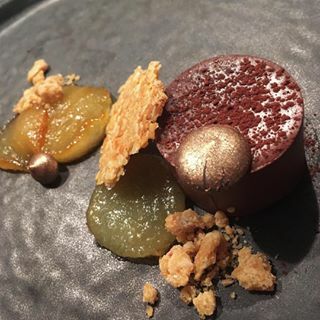 Unfortunately, it can be difficult to make and there is a large risk of overcooking when making this dessert in an oven. The lack of a good oven is in fact one of the reasons why I never made this at home! Luckily, we don’t have to use an oven! 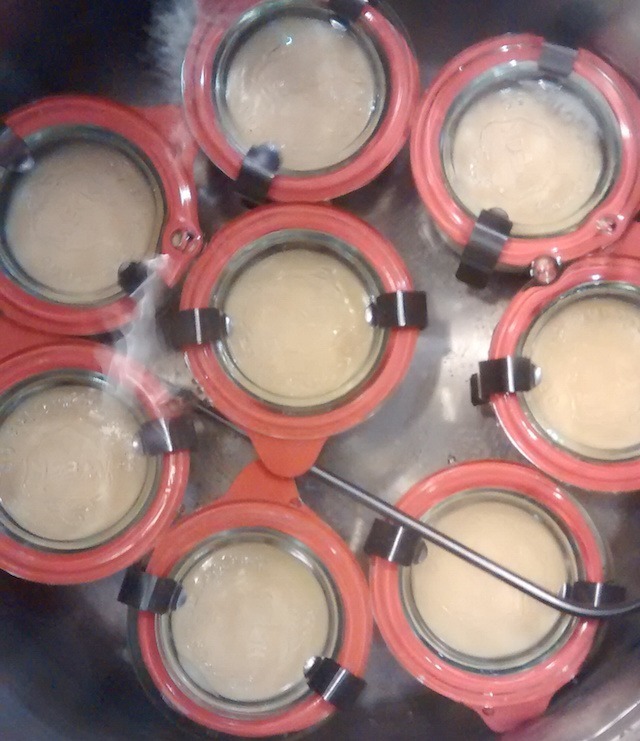 I got inspiration from a ChefSteps recipe and tried to make my own crème brûlée in a new way: using a water bath. By using a water bath, similar to sous vide cooking of meat and vegetables, we can precisely control temperature and prevent any overcooking. As I am still waiting on my immersion circulator to arrive, my ‘cooking-experimentor-in-crime’ Maaike and I had to resort to a more low-key approach: the ‘stove top’ method. While a good sous vide setup is advisable, this recipe can also be done using a regular pot, a thermometer and canning jars. And guess what, it worked perfectly! So, if you are a crème brûlée enthousiast and have some canning jars laying around, you should definitely try this! You can scale the ingredients according to the size of your jars. I’ve used this recipe to fill approximately 12 small jars. 30-40 minutes active time, 1 hour cooking, 10 minutes for serving. Combine the egg yolk, sugar, salt and vanilla. Wisk until smooth. Heat the heavy cream in a small pot. Don’t let it cook. A temperature around 70°C is oke. After heating, slowly combine the warm heavy cream into your mixture. If you go to fast your eggs will turn in some sweet form of scrambled egg. Let the mixture set for 15 minutes, remove any bubbles from the top with a sieve or slotted spoon. Make sure that your jars are very clean. Slowly fill each of your jars with the mixture. You can use a scale if you want to be exact. Try not to create any bubbles. I’ve used Weck jars but other canning jars are also possible (e.g. Mason jars). The main requirement: they need to be able to release air during the cooking process and not let water in. If there are any bubbles at the top of your mixture you can carefully remove them with a blow torch. After filling, close each jar. If you misplace the rubber band (as I did for one of my jars) they will fill up with water during the cooking process. Mason jars should not be closed to tight or air won’t be able to escape. Heat a water bath to 80 °C. 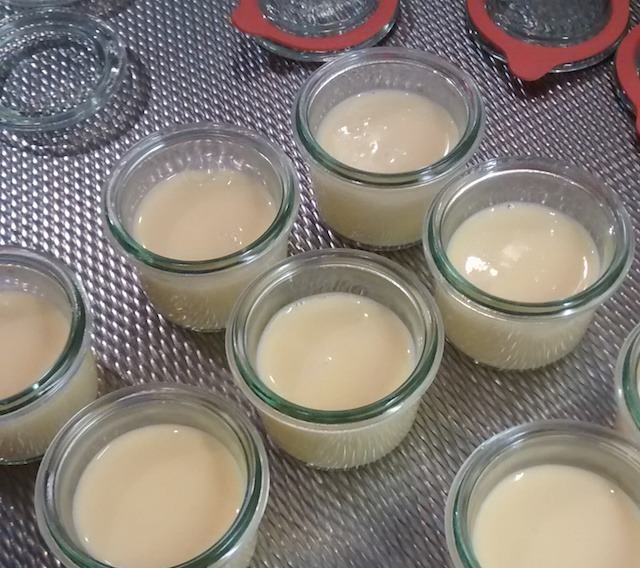 The exact temperature is important: to hot and your eggs will start to curdle, to low and the custard will not set. I’ve used a large pot, put it on my stove and monitored the temperature with an external thermometer. Of course, you can also use a sous vide setup (which will save you the hassle of constantly checking the temperature!). Add the jars to the water bath, cook for 1 hour. You will see small air bubbles escape from the jars. This is normal and part of the process. Remove the jars from the water bath and cool them in a water/ice bath. Do this carefully, there is a small risk of breaking your jars. Store the jars closed in the fridge until serving. You can do this a few days in advance. Just before serving, open the jars and add regular granulated sugar. Use a blow torch to carefully create a “brûlée” topping on your custard. Be generous with the amount of sugar, you will see that this helps create a nice crust. 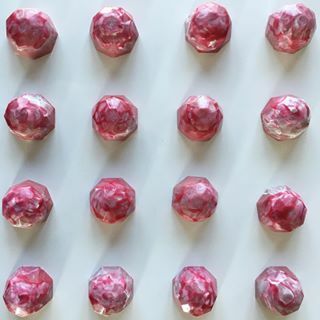 Tutorial on making ruby chocolate bonbons with various fillings. A rich and versatile recipe for chocolate mousse. My go-to recipe. Can be used for entremets, filling molds or on its own. Vegan experiment: A dark chocolate crème mimicking the richness of an egg-based dessert.